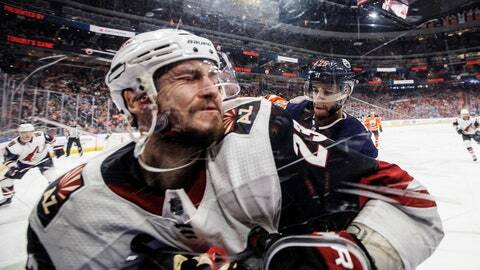 EDMONTON, Alberta (AP) — Conor Garland didn’t even need his stick to help the Arizona Coyotes beat the Edmonton Oilers. “I wasn’t too sure what hit me,” said Garland, who needed 10 stitches after the puck struck him above the left eye. “I knew I got hit and then I saw the blood and as I was going off the ice, someone yelled ‘nice goal,’ so that’s when I realized. Then it was on the TV in the medical room, so I got to see it. NOTES: The Coyotes have been riddled with injuries this season, coming into the game with 210 man-games lost to injury or illness. That’s the third-most in the NHL. Among those out for Saturday’s game included Christian Dvorak (upper body), Jason Demers (upper body), Antti Raanta (lower body), Michael Grabner (upper body), Nick Schmaltz (lower body) and Brad Richardson (upper body). … Center Jordan Weal made his debut for Arizona after being acquired from the Philadelphia Flyers on Friday in a trade for defenseman Jacob Graves and a sixth-round pick.